OPEL could become Australia's performance car gem of the motoring industry. The German brand officially launched itself Down Under during September, and its souped-up derivatives will arrive in March. Opel Performance Centre versions of the Corsa three-door light-size hatch, Astra three-door small hatch and Insignia sedan will lead the performance offensive. If our recent test of the Astra Turbo is any indication, we're in for some fun come 2013. While it doesn't come with all the bells and whistles of the OPC stablemates, this is still one hot little hatch. The Astra Turbo resonates athleticism - inside and out. Sports seats hug the driver and front passenger into place with large bolsters at the seat base and laterally (they also have special ergonomic accreditation), while the leather-trimmed steering wheel inspires the driver to explore the car's boundaries. Soft-touch materials are used where it matters most, yet there are some hard plastics throughout which don't detract from an otherwise thoughtful cabin. Showing its age somewhat, there are a raft of buttons on the Astra Turbo dash which can be confronting on first introductions. Many of the functionalities will no doubt be integrated into the touch-screen in future models, but it just takes some time to become accustomed to the positioning of various dials and buttons. Head and legroom are reasonable. Sitting lower than your run-of-the-mill Astra with 18-inch alloys, the Sport Turbo offshoot has a dynamic personality. Our test car had the optional $2000 Flexride Adaptive Chassis system which enables you to choose between firmer or softer suspension settings - depending on your mood. "Sport" is better for flatter cornering and alters the various safety systems for when you are pushing its limits, "Tour" does a better job of ironing out the bumps. The 1.6-litre turbocharged unit is a zesty powerplant that delivers a wonderful shunt about 3000rpm. Things can get doughy if your revs drop below 2000rpm under load, although keep it spinning and the Astra will power through all scenarios. Apart from some vagueness around centre the Astra steering is direct and accurate. Corning and changing direct is done with ease and it takes some effort before oversteer arrives. Safety is looked after by way of dual front, front side and curtain airbags, while it is also armed with electronic stability control, traction control and anti-lock brakes. Also worth considering is the Hyundai SR Turbo Coupe ($31,990), Citroen DS3 DSport ($27,990), Mini Cooper S ($40,700), Volkswagen Golf GTI 5-Dr ($40,490), or at the cheaper end there is the naturally aspirated Suzuki Swift Sport ($23,990). Official figures have the average fuel consumption at seven litres for every 100km, but we could only manage 9.6. The turbocharged engine variant may see some inflated premiums from some insurers so it would be worth shopping around. 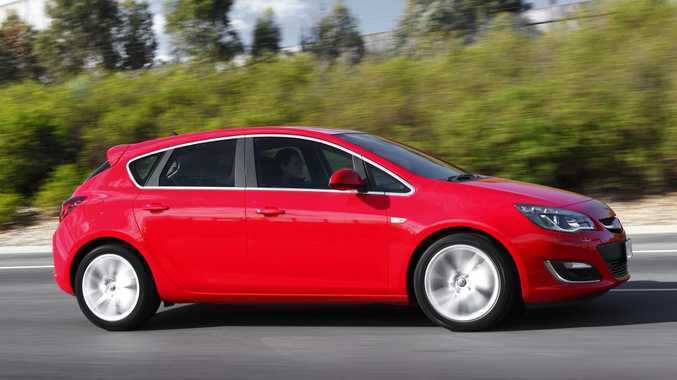 The Astra offers an impressively large boot, bolstered by the space-saver tyre. The back seats fold in a 60-40 configuration so bulky items are easy to carry. Up front there is some good storage spots, particularly useful is the bin in front of the shifter for phones and chargers, while there is a cup holder and two bottle holders in the console (along with two in the rear arm rest that drops down in the back seat). Shapely and attractive from all angles, there is a lot to like about the Astra Sport's athletic proportions. Inside there are some cool red hues, with LEDs providing lighting in roof console, doors and centre console. Opel has a hairy-chested package with the Astra Sport. It's well specified and the turbocharged powerplant delivers enough punch for most drivers - but those who want a true hot hatch would probably best wait for the OPC version that will be available within a couple of months. The good stuff: Fun to drive with a nice turn of speed, sporty interior and exterior. What we'd like to see: Less buttons on the dash, better real-world fuel economy. Warranty: Three years or 100,000km. Services are no more than $299 at 12 months/15,000km, 24 months/ 30,000km or 36 months/45,000km. Model: Opel Astra Sport 1.6 Turbo. Details: Five-door front-wheel drive sports hatch. Engine: 1.6-litre four-cylinder turbocharged petrol generating maximum power of 132kW @ 5500rpm and peak torque of 230Nm @ 2200rpm. Transmission: Six speed manual (as tested) or six-speed automatic. Performance: 0-100km in 8.5 seconds. 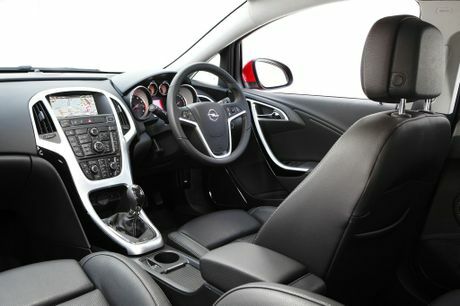 Inside the Opel Astra Turbo.